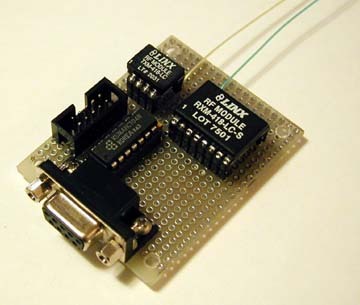 Small: without interface connectors, transceiver fits in less than 1.5"x0.5"x0.25"
For AVR users, the AVRlib "stxetx" function library will allow you to send data packets over this and other radio links with strong rejection of communication noise. The "stxetx" protocol provides packetization and checksum protection for user data. The "stxetx" function library is available now. See the AVRlib example application code for help on how to use it. See Linx Technologies' data sheets and extensive application notes for more technical information and design details.